Cumbria is a large county in North West England and contains the Lake District and Lake District National Park. It is bounded to the north by the Scottish Borders, Dumfries and Galloway, to the west by the Irish Sea, to the south by Lancashire, to the south east by North Yorkshire, and to the east by County Durham and Northumberland. Cumbria is very mountainous containing every peak in England over 3,000ft above sea level with Scafell Pike being England’s highest mountain at 978 m (3,209ft). Cumbria is also one of England’s most outstanding areas of natural beauty attracting mountain climbers, hikers and walkers, cyclists, runners and tourists and holds a source of inspiration for artists, writers and musicians. Cumbria consists of six districts Eden, Carlisle, Allerdale, Copeland, South Lakeland and Barrow-in-Furness. The Lake District is an area with stunning scenery located within in the County of Cumbria. Commonly known as The Lakes or Lakeland it was granted National Park status on 9th May 1951 less than a month after the first UK designated National Park, The Peak District. It is the largest of thirteen National Parks in England and Wales and the largest in the UK after the Cairngorms. The Lake District National Park itself covers an area of 885 square miles and stretches 30 miles from Ravenglass in the west to Shap in the east and 35 miles from Caldbeck in the north to Lindale in the south. Crammed with so much natural beauty the Lakes attract visitors, tourists and holiday makers from all over the world. As the name suggests there are many lakes each with their own uniqueness, amenities and activities such as lakeside walks, sailing, waterskiing, boat trips and ferries. All of the lakes except Bassenthwaite Lake are named by water, tarn or mere and are surrounded by stunning scenery and magnificent fells. There are some wonderful towns to explore such as Keswick, Windermere, Ambleside, Kendal, Hawkshead, Grasmere and Cockermouth all with a splendid mixture of shops, cafes, pubs, bars and restaurants. There are also many museums, theatres, historic homes, gardens and many easy walks for the not so energetic visitor wishing not to climb the fells. William Wordsworth the famous British poet was born in Cockermouth and later lived in Grasmere where he wrote some of his best works before moving to Rydal Mount near Ambleside for his last 37 years. Both places are open to visitors and so is Brantwood home to John Ruskin until his death. Samuel Taylor Coleridge, Robert Southey and Thomas de Quincey all followed Wordsworth to the Lake District. Arthur Ransome, author of Swallows and Amazons, also grew to love the lakes and settled in the Winster Valley near Windermere. The painters Thomas Gainsborough, JMW Turner and John Constable were early visitors to the lakes but it was John Ruskin who settled here at Brantwood on the shore of Coniston Water. Farming and especially sheep farming has been historically and still is the main industry of the Lake District. The tough Herdwick breed with their stocky build and distinctive grey coat are especially hardy for the Lakeland fells and its weather. Sheep farming has probably been here since Viking times and is an important factor both to the economy of the lakes as well as in preserving the stunning landscape which attracts visitors and hence income to the region. Walking is a big attraction in the Lake District whether strolling around the low lying lakes or climbing up into the mountainous fells whichever is undertaken the scenery is magnificent. Alfred Wainwright’s famous hand written book, The Pictorial Guide to the Lake District, published in 1955 is a collection of seven books each illustrated with his unique style and charm of the 214 fells inspiring many visitors and tourists from all over the world. Martindale is a beautiful valley that lies on the east side of Ullswater. Completely unspoilt this quiet valley even in the summer is reached by a mountain pass that ascends from Howtown. Martindale within the Lake District National Park runs for about 5½ miles. The foot of the valley is located at the small hamlet of Sandwick while its head is situated on the slopes of Rampsgill Head where the headwaters of Howegrain Beck rise at a height of around 700 metres. The upper part of the valley is divided into two sub valleys, Bannerdale and Rampsgill, by the fell of The Nab. The becks of Bannerdale and Rampsgill meet halfway down Martindale to form Howegrain Beck which then becomes the main water course for the lower part of Martindale. It then enters Ullswater at Sandwick near where Martindale is joined by the side valley of Boredale. The lower area of Martindale where the mountain pass comes over from Howtown is the main area where there is House Farm, The Old Reading Room and a few self-catering cottages. St Peter’s Church, dating from 1880, often referred to as the New Church is situated at the top of the pass. A little further up the valley is the restored St Martin’s Church often referred to as the Old Church has existed since at least 1220, the present building dating from the end of the 16th century. There have been many restorations but the last major restoration was in 1882 when the roof was replaced. Violent storms destroyed the roof on the day that the new church of St Peter was consecrated. It is now a Grade II listed building and only used occasionally. Objects of interest include the 1634 reading desk, the font is believed to be part of a Roman alter, the church bell which is 500 years old and the yew tree in the church yard is estimated to be about 1300 years old. The church is frequently visited by passing hill walkers and tourists. Half a dozen farm buildings occupy the mid and upper parts of the valley. Martindale’s wildlife includes red squirrels, badgers, hares, herons, woodpeckers, owls, falcons and the local Herdwick sheep can be seen everywhere in the fields or on the open fells. The upper part of Martindale around The Nab is a deer reserve which is not open to the public and contains no rights of way but due to the Countryside and Rights of Way Act 2000 The Nab is now open access and walkers are requested to keep to the preferred routes which avoid the herds when climbing The Nab. The reserve is home to the oldest native red deer herd in England. At the foot of The Nab is “The Bungalow” which is a former shooting lodge built in 1910 by Hugh Lowther 5th Earl of Lonsdale for a deer shooting visit by the German Emperor Wilhelm II in the same year. The Bungalow is now used as a self-catering accommodation which houses 12 people. The walk along the High Street ridge or a walk through the valley of Bannerdale could well reward you with sightings of these beautiful red deer or even a golden eagle. High Street at 828 metres (2718 feet) has the highest summit of the far eastern fells of the Lake District National Park. A wall follows the ridge over the flat summit known as Racecourse Hill and its highest point is marked by a white OS triangular column. Fell ponies can often be seen grazing there. The views are amazing stretching from the Pennines in the east to a fantastic curve of Lakeland fells in the west. The Helvellyn Range and the Southern Fells are the most striking. High Street’s eastern side is craggy and sheer as it falls away towards Haweswater and holds two tarns Small Water and Blea Tarn, the latter being the deepest in the Lake District. The best ascents of the fell can be walked from the east and the climb from Mardale has spectacular views down into Riggindale where a golden eagle may be sighted. The eagle, the only bird of its kind left in England, is a solitary male which has been on its own there since 2004. High Street takes its name from the Roman Road that passes over it. High Street the 2000 year old Roman Road was built by the Romans to link their forts at Brougham near Penrith and at Ambleside. 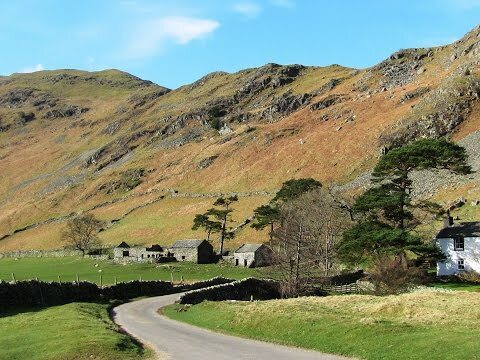 Being situated in one of the quieter areas of the Lake District the High Street range with its gentle slopes and a flat summit was the reason why the Romans built the road over the top rather than through the densely forested and marshy valley. It is said that it follows the line of a much older Prehistoric track and on some stretches you can see kerb stones and patches of metalling. During the 18th and 19th centuries the fells flat summit, Racecourse Hill, was used as a place for summer fairs the last being held in 1835. Locals from the surrounding area would gather on the 12th July to return stray sheep to their owners and games, wrestling and horse racing would take place. Fell ponies can often be seen grazing there. Parts of the route are managed by the National Trust. Wether Hill at 674 metres (2211 feet) is located on the north south ridge of High Street between Martindale and Haweswater. On the ridge to the north across a broad depression is Loadpot Hill and to the south the main ridge narrows before climbing to Red Crag, an outlier of High Raise which is its parent peak. Smaller ridges also radiate out to the east and north-west. The western side of Wether Fell falls steeply into Rampsgill, part of the Martindale valley. The grassy top of Wether Hill has two summits the one to the south is broader while the northern top is the traditional summit bearing a cairn. The Roman Road, High Street, narrowly avoids both tops. Howtown is a small quiet hamlet situated at a small harbour on the eastern shore of Ullswater about 3½ miles from Pooley Bridge. Howtown means farmstead on the hill and was founded by the How (or Howe family). The hamlet houses the Howtown Hotel and an Outdoor Centre. The pier, where the Ullswater Steamers drop off and pick up on the Glenridding to Pooley Bridge cruises, has wonderful views across the lake towards the northern end. With the Old Church of St Martin on our right we walk on the road for a short way and turn right at the public sign post going round the back of the church. We head forward on the path with the wall on our right. When we reach a wooden gap in the wall with a barn down below and two farms at the other side of the valley we turn sharp left on a faint footpath. The path bears right becoming more distinct and we follow it uphill towards the left of a lone tree and a wall. We go through the gap in the wall and continue following the path, a wall soon becomes visible on our left. We keep heading forwards round the side of the hill. The path starts to go downhill towards two ruined buildings. We go through the gap in the wall crossing over a stream and head forwards to the right of the two ruined buildings. We keep following the path bearing to the right with the broken wall on our right. We pass three pillars/columns in the wall and keep heading forwards uphill until we come to a wall in front of us. We turn left uphill. When we reach the track, High Street, we turn left and keep following the path over the top bearing left when the path splits. Soon after passing a cairn the path splits again and we take the left path. We come to a very small cairn made of just a few stones we turn left here downhill on a very faint path. As we head down the path becomes more visible. Towards the bottom of the valley the path bears right to cross over a stream below a gill/gully. We keep following the path with the stream on our left towards Ullswater in the distance. We pass a ruined building and a seat, cross over two wooden bridges and then a small stone slab bridge. We turn left along the tarmac track towards Howtown and Ullswater following the stream now on our right. When we come to a junction of paths and a sign post we turn left uphill with the wall on our right. (The path straight forward takes you to the ferry landing). The path bears left uphill and we keep left ignoring the paths going off to the right. After passing a little pond we go through a gate in the wall and keep bearing left with the wall on our left. We pass a seat and then head downhill passing in front of some buildings to the road. We turn left and follow the road back to the church. This is a moderate walk on grassy or stony paths and tracks some parts very faint. There are some steep inclines and declines. Elevation: approx lowest point 176.40m (578.74ft) approx highest point 669m (2194.88ft). Approx 5.75 miles allow 3¼ hours using OS Map OL5, The English Lakes North Eastern area. Start Point: St Martin’s Church in Martindale. From the A66 just after the M6 roundabout take the A592 sign posted Ullswater and Windermere. At the t-junction turn left to Pooley Bridge. Go through the traffic lights and then turn left immediately after the church. At the crossroads turn right and follow this road to Howtown. Continue forward on the small road going up a steep mountain pass, with leg bends, to the top. Continue forward past the church of St Peter then head downhill to the houses and a t-junction. Bear left downhill to the Church of St Martin on the left. Parking: grassy area near the Church of St Martin.